Can Encouraging Goodness and Generosity Build Your Business and Your Life? Home/beliefs, Blog/Can Encouraging Goodness and Generosity Build Your Business and Your Life? I just read a great article on ProBlogger one of my favorite blogs. They not only give away tips but they give away heartfelt thoughts. In a most recent blog, Are You a Generous Blogger,” they talk about blogging and generosity. It started me thinking about generosity in general. I was having a conversation with a friend of mine last night on that very subject. She was asking how much do you have to give away to get business? Is that why we give away? Is giving away to get back? I get so much “give away” in my mailbox that I don’t even look at it any more. I often have the feeling that the “give-a-way” is like a rubber band–I give you a little and then I pull you back in. Is that really a “give-a-away” is it really generous? My friend is very generous and helpful, call him up and he will help you with your business; he is known as “Mr. 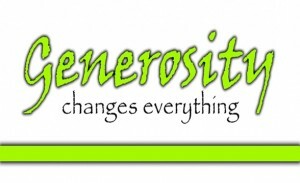 Generosity.” Does it get him business? Maybe not directly but isn’t “friendliness” important in business? Is it too much to say “I give because I love you” and nothing more? You send me a Facebook request, I do a search on your name, see how we’re connected and send you a note with your request. To me that’s generous. I’m always surprised when someone takes the time to add a note to their Facebook request. A note more than, “I would like to add you to my professional network.” Sure it takes time but isn’t time one of the most precious things we can give another person? Time is one of the things most of us lack and the most generous thing we can share or give away. This morning I got a note from a new Facebook friend who said I like being your friend. I decided to reciprocate and return the compliment; I like being her friend also. I like her posts and her ideas. How about generous companies and celebrities? http://bit.ly/oix7Xx Wal-Mart the most generous? Walmart adopted the Porter school this year and has been providing much-needed school supplies. http://bit.ly/n7o5jy Oprey Winfrey? Oprah invested $40 million to create the Leadership Academy for Girls near Johannesburg in South Africa. http://amzn.to/oTI8ng “The Giving Tree” by Shel Silverstein, the story about the tree that loved the little boy published in 1964.
http://bit.ly/19I40X Kroeger is one of the most generous. Your friends who are always available to answer a question, share a plate, pull the weeds in your garden, lend you a book, help hang the drapes, wish you a good day? How about the ones who send notes and ask how you’re doing? I have some wonderful friends outside of Albany, Linda and Mike Urbanski. They send me notes, call to say hello, and connect on Facebook. In fact, Linda sent me a silly note this morning. They are generous of spirit. Give something away today; to a friend or a customer. A smile, a thank you or a compliment and watch the results. Call a good customer and ask how they’re doing. Compliment someone at the health club for their effort, this will get a big smile of appreciation. Hug your pet and tell them how great they look. My friends tell me their dogs smile when they do this. No response from my cats. I learned the same thing from many of these bloggers. They freely give away information, help, and they only ask for an email address. I have learned so much in the way of generosity from my young friends under 40. They adopt kids, animals, give when they don’t have a lot, and are even gracious to boomers like myself. They seem to understand generosity more than I do: but I am learning. Thanks for the timely post Liz. Every generation seems to have a “beef” with the younger generation. I remember being a “younger” generation myself. We say they don’t contribute, are lazy and aren’t aware. Our younger generation is more aware than we ever were, they care about the enviornment and each other. They ask if they can shovel my walk, plant flowers with me and come to my parties! I’m on there side and am happy so many are my neghbors. Thanks for the note.